I am sitting here at 10:30am waiting for a session that does not start until 1:15pm. The session introduces the stars and film clips from the upcoming movie Twilight. 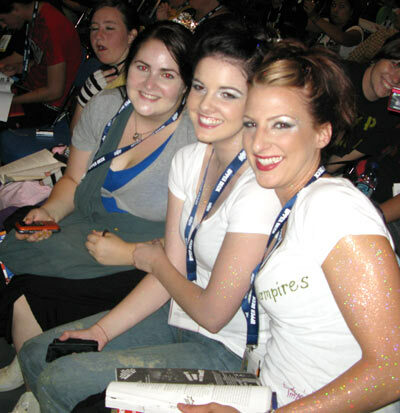 I am sitting her with a group of Twilight girls, passionate fans of the incredibly popular book series written by Stephanie Meyer. Next to me the Twlight girls are decorating their T-shirts. One says, “I believe in vampires,” and another, “Team Edward.” Other Twilighters favor “Team Jacob,” the Twilight werewolf. Like the vampires in the Twilight stories, the skin of the fans next to me sparkles in the sunlight and their loyalties are to Edward Cullen, the gorgeous vampire who becomes the love of a high school girl in Washington state town. They are also Harry Potter fans and the parallels between the two stories are interesting, not least because some people believe that Twilight will surpass HP in fandom and readership. We actually have to sit through a session on the remake of the classic science fiction movie, The Day the Earth Stood Still, and a movie made from the video game, Max Payne. The star of TDTESS, Keanu Reeves, is supposed to be here. In front of me one guy asks another, “Is Twilight a good book?” The mixture of people at Comic-Con, which is a vast celebration, as the conference tagline says, of the popular arts, is wild and hard to gauge. The cross-overs between movies, comics, books, clothing, toysand other things are not just a marketing ploy. Merchandising is a crucial part of re-enacting and experiencing the stories from all these movies, comics, books, and blogs. SCREAMS and CRASHES!!!! A huge curtain that covers the back of the hall, held up by metal support rods, comes crashing down across the back of the room. Cameras flash, the staff comes running and the twisted wreckage forms mountains across the back wall. Welcome to Comic-Con. Earlier this morning I waited in line for 30 minutes to try to get a place in another line in order to get an autograph from one of the stars of the movie. I was not successful but the screams of the girls who succeeded were delightful and the pained faces of those who failed were a great demonstration of just how much these fictional worlds mean to people.